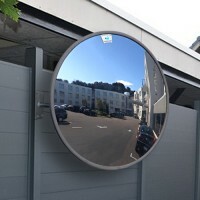 If you need a mirror to see around the corner, these round convex traffic mirrors are designed to improve road safety for streets, minor roads and intersections. They are equally effective as a driveway mirrors or parking lot mirrors giving wide and extended view around tight corners and blind bends. Designed specifically as a robust external weather proof mirror it features heavy duty steel engineering and is galvanized for long life. These traffic safety mirrors will improve the safety of many at risk areas and give years of low maintenance service. 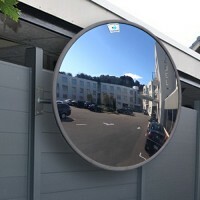 The 12" Driveway Traffic Mirror is designed to improve road safety for streets, minor roads and inte.. 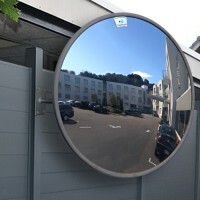 The 24" Driveway Traffic Mirror is designed to improve road safety for streets, minor roads and inte.. 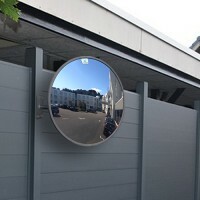 The 30" Driveway Traffic Mirror is designed to improve road safety for streets, minor roads and inte.. 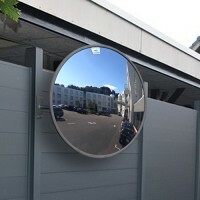 The 36" Driveway Traffic Mirror is designed to improve road safety for streets, minor roads and inte..